The Bard of Avon himself, William Shakespeare, wrote in Hamlet “Brevity is the soul of wit”. In other words, “Keep it simple, stupid”. In other words, “Don’t waste our time”. Unfortunately, it’s hard not to feel strung along when you’re watching the second installment of a trilogy of film adapted from a novel that barely scrapes 300 pages. The film, of course, is The Desolation of Smaug, the second film in The Hobbit series. Despite the unarguable passion that director Peter Jackson has for original author J.R.R. Tolkien’s works, one might find himself wondering if there’s truly any relevance to half of what he (or she) is watching in the film outside of an equally unarguable and frivolous attempt by the studio to prolong their current golden opportunity at a cash grab. 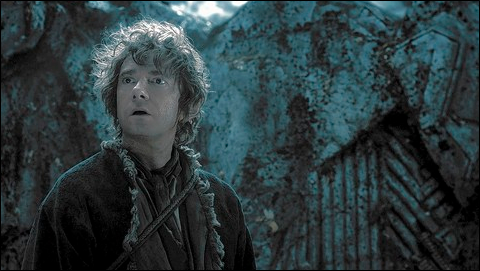 After an inconsequential prologue, the movie picks up with the eponymous hobbit (Martin Freeman’s Bilbo Baggins), company of dwarves (led by Richard Armitage’s Thorin Oakenshield), and Gandalf the Grey (Ian McKellen) as they continue their quest to the Lonely Mountain to confront the powerful dragon, Smaug (voiced by Benedict Cumberbatch), and reclaim the dwarves home. However, for the sake of extending the movie (to the outrageously unnecessary length of two hours and forty minutes), we are also introduced to Tauriel (Evangeline Lilly), an elf who partakes in a minor love triangle with Legolas (Orlando Bloom) and dwarf Kili (Aidan Turner). Gandalf also begins an investigation alongside fellow wizard Radagast (Sylvester McCoy) into the dark forces that threaten to consume Middle-Earth, which are affiliated with a growing orc army. As one familiar with the source material may ascertain, there is much deviation that occurs. At this point, let me clarify that deviating from an adaptation’s source (generally) does not bother me. Having said that, the changes made to the story here felt like little more than fluff to pad out the film. The romantic subplot contributed nothing. Gandalf’s investigation (which he spends just about the entire film conducting) results in nothing new being discovered. The elves’ enlarged role in the film was more or less for the sake of some extra (albeit exciting, though cartoonish) action set pieces. The political strife of Lake-town ultimately proves to have no influence on anything; and when the heroes finally make it to the Lonely Mountain, it all culminates in such an anticlimax that you’ll be left wondering what it was all for. It’s true that Jackson’s modifications increase the scope of the story and expounds further upon the state of Middle-Earth at this time, but he wastes your time in doing so. The performances are all solid and the movie looks good (if too cartoony in comparison to the original trilogy), but to what extent? Let’s be honest: Desolation of Smaug is filler. It feels like filler when you’re watching it. There’s plenty spectacle and drama to immerse you for the ride; however, it’s once you’re off and the lights come back on that you realize that you just paid the price of admission just to be in the same place you were before said lights dimmed.